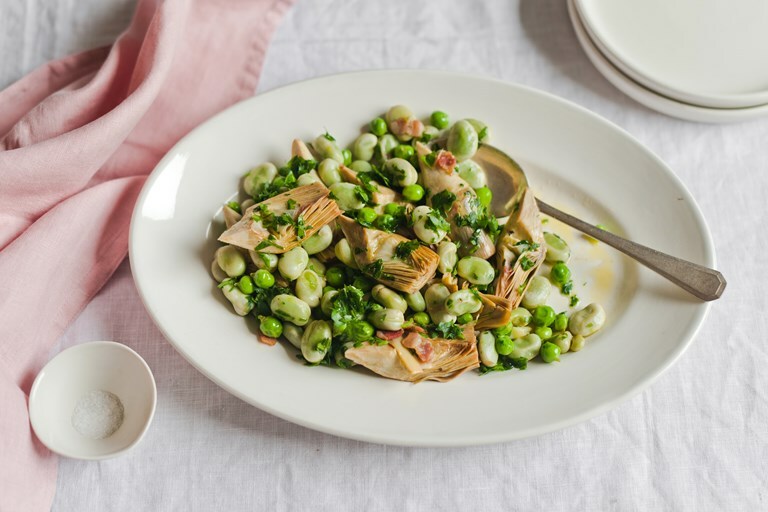 Valeria Necchio's vignarola recipe is a celebration of late spring, when artichokes, broad beans and peas all come into season in Italy. This Roman vegetable stew is just the dish for when the weather gets warmer and you want to make the most of bountiful fresh vegetables popping up in markets. Vignarola is a spring vegetable stew hailing from Rome. An explosion of flavour and greenness, it is in season when its three main components – broad beans, peas, and artichokes – overlap at the market and are at their sweetest and most tender, normally from April to late May. As it happens with most Italian traditional dishes, there are as many versions of vignarola as there are cooks. However, the basic concept remains pretty much unchanged: the vegetables are slowly braised in a mix of olive oil and water and/or white wine until glistening and tender and bursting with flavour. Some recipes call for a soffritto of guanciale (or pancetta) and onions (or spring onions) before the rest of the vegetables are added to the pan. Some others swear by the inclusion of some finely shredded lettuce (another spring crop). Fresh mint or calamint (nepitella or mentuccia) are traditional garnishes, though it’s not uncommon to see a handful of finely chopped parsley thrown in, too. Whenever I make vignarola – and that’s about twice a week when the season is in full swing – I tend to skip the cured pork in favour of an extra glug of good olive oil. Normally, I opt for spring onions, to which the artichokes are added, then the cooking liquid (a plentiful mix of water and white wine that will reduce but remain abundant at the end), then a lid. At the very end, I stir in the rest – broad beans first, then the peas. The lot is finally left to mingle and absorb some cooking juices for a couple of minutes, just enough for the peas and beans to be softened while still bursting. At the very end, in goes a dusting of parsley (or, if you prefer, roughly torn mint), which will wilt ever so slightly in the steamy pile as it’s removed from the heat. Vignarola lends itself to many ways of serving. For instance, it makes a great sidekick to grilled lamb chops or fresh cheese, from ricotta to burrata to spring-y pecorino. I also like it tossed with spaghetti or bucatini, then covered in grated pecorino romano, or piled on toast for a quick, picnic-style lunch. If served on its own or on the side, remember to let it rest for a short while in the pan so it can settle and cool down; also, keep plenty of good bread handy to mop up the cooking juices.